Vita is a magazine published by the biggest news organizations in Greece, Lamprakis Press. It’s website, vita.gr, is the largest national website about health, wellness, nutrition and fitness. Vita wanted to research their audience (interests, habits, etc.) through an online survey that was promoted with ad banners on vita.gr. As for any survey, a certain number of completed surveys needed to be reached in order to ensure statistical significance. The banner campaign promoting the survey was already running for 24 days and Vita had only received about 10% of the goal number of completed questionnaires they wanted. The challenge for Exit Bee was to create a campaign and convince visitors to take action and complete the survey. Moreover we needed to convert them without offering an incentive or a prize. The first thing we wanted, was to ensure our campaign was able to visually grab users’ attention, when they were leaving the website, enough for them to read the title. To achieve this we used a full screen design with a bright blue-ish color. Then we thought about the title, we used a large font size and all capital letters, and copy that would make abandoning visitors want to read the subtitle to learn how. The copy we used was “Your opinion matters”. You know how most people are more likely to do something for you if you ask for their help rather than if you just asked them to do it. We all like to feel that we can help, especially if it’s something that requires a couple of minutes of our time. So we added a call-to-action button with the text “I want to help”. We ran the campaign on all abandoning visitors regardless of category or post. The visitors wanted to help and were willing to spend a few minutes to complete the survey. But they’re used to banners ads and don’t really pay attention to them. 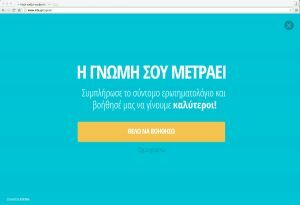 When vita.gr asked the visitors to take the survey, without interrupting their experience while browsing the website, a surprisingly big portion of them responded positively. In less than two days (!) Vita collected the remaining 90% of the completed surveys. Exit Bee increased the conversion rate by over 17,000%. Vita would need about 200 days to collect the number of surveys that they did in just 2 days with the help of Exit Bee.